NO CHARGE TO GET IN --- FREE DRINKS AND SNACKS! this Family Support Group Meeting is for YOU! 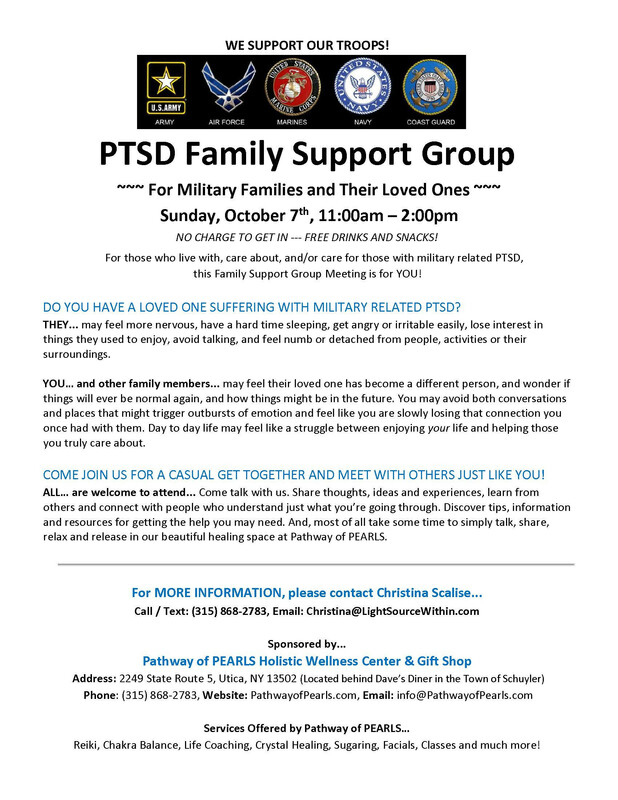 DO YOU HAVE A LOVED ONE SUFFERING WITH MILITARY RELATED PTSD? THEY... may feel more nervous, have a hard time sleeping, get angry or irritable easily, lose interest in things they used to enjoy, avoid talking, and feel numb or detached from people, activities or their surroundings. YOU… and other family members... may feel their loved one has become a different person, and wonder if things will ever be normal again, and how things might be in the future. You may avoid both conversations and places that might trigger outbursts of emotion and feel like you are slowly losing that connection you once had with them. Day to day life may feel like a struggle between enjoying your life and helping those you truly care about. COME JOIN US FOR A CASUAL GET TOGETHER AND MEET WITH OTHERS JUST LIKE YOU! ALL… are welcome to attend... Come talk with us. Share thoughts, ideas and experiences, learn from others and connect with people who understand just what you're going through. Discover tips, information and resources for getting the help you may need. And, most of all take some time to simply talk, share, relax and release in our beautiful healing space at Pathway of PEARLS. Return to a complete listing of all UCD news and events.